An overview of northern Garund’s perilous desert nations, including alchemy-fueled Thuvia, godless Rahadoum, and treasure-laden Osirion. Detailed examinations of the people who populate Golarion’s harsh deserts, including the silver-tongued Keleshites, the enigmatic Pahmet, and the proud Garundi. New magic items and equipment designed to help adventurers survive the hazards of the unforgiving desert. New feats and spells to steep characters in the desert’s rich history, as well as two new prestige classes iconic to these harsh realms. Campaign traits perfectly suited for characters taking part in the Mummy’s Mask Adventure Path. New rules options for characters drawn to the desert, including a new oracle archetype, a new sorcerer bloodline, a new cavalier order, and more. Written by Shaun Hocking, Rob McCreary, and Jason Nelson. Total: 14/15 Stars, or 4.5/5 Stars, rounded up to 5 Stars for sheer quality. As far as I’m concerned, People of the Sands is the definitive guide to desert PCs. It feels very complete offers 32 pages of background information essential to playing a character from this region. I would have preferred the artwork to match the topics a bit better and one piece in particular heavily contributed to the product’s 4 Star rating in the Texture department, but in all this is an excellent product that makes for a strong addition to any GM or Player’s repertoire. Read the full review at the Everyman Gaming blog. Basics: Come on down, hope a carpet and fly! 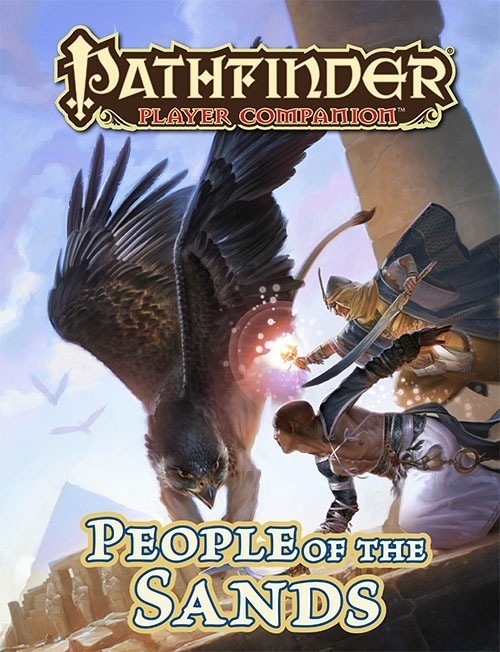 People of the Sands serves as a guide book to Osirion, Rahadoum, Thuvia, and deserts in general as well as being the Mommy's Mask Players Guide. The book starts with the ancient and no so ancient history of Osirion. Then, it moves to the different types of people who live there. The centerfold of this book is a beautiful, weathered player map of Osirion. Next, the book discusses the three major desert modern day nations of Golarion. The last section of the book transitions to more player focused offerings covering two new player prestige classes, new magic and normal items, and then the players guide for Mummy's Mask. I don't know why I continue to purchase these Player Companion releases. Very few of them have been worth my time or money. And this is another that's not worth it. The editing/layout is awfully inconsistent. It looks like different people did the layout for each page. For example, the Living Monolith Prestige Class actually says "Living Monolith Prestige Class" in its title bar, yet the Thuvian Alchemist Prestige Class just says "Thuvian Alchemist" in its title bar. I was really hoping that the new Elemental Oracle Archetype would be worth it, but it's pretty darn mediocre. The Thuvian Alchemist actually is pretty decent if you want a healing-focused Alchemist. The Living Monolith still feels awfully powerful. I could be wrong, but it seems even better than the original one that was printed in that other book. I'll admit that there are a few traits and feats that I might consider taking for certain characters, but I wouldn't miss them if I had never purchased this book. I’m sure I’ve mentioned before that region-based supplements tend to be my favourite ones, and People of the Sands certainly doesn’t disappoint. As part of the Player Companion line of products, it contains a lot of new mechanical options (as well as updates to things like the living monolith prestige class). However, it also contains a good balance of fluff, with background information on the histories and peoples of the region it covers, making it a book that is entertaining and informative to read, and useful for gameplay. Less a players guide to the people of the sands and more of a primer for a handful of locations with little but their general climate in common. Particularly Rahadoum kind of felt out of place (and again. . .? ), but with little new ground. It also seems to paint a different picture of Rahadoum than other sources? I really hate the format (still) and especially in this book those dang Roles. And while it is not a copy/paste, there is little here outside of what has already been presented (multiple times at that) in other books such as the Inner Sea World Guide. There are two Prestige Classes, the reprinted/updated Living Monolith, (meh in my opinion) and the Thuvian Alchemist, (sort of a healer alchemist). Yet another Sorcerer Bloodline (looks like it could make a nasty NPC) and Oracle Archtype (just kind of seems thrown in here). Something I would have liked instead would be options for "desert-based" clerics, cavaliers, paladins, and other classes that are normally more Western European themed. Archtypes to help allow divine casters to be able to play in Rahadoum, or more things along those lines and usefulness. There are a few items presented, and I'm pretty happy with those, and very surprisingly, the majority of it is actually in the price range that it might be used before Epic Level, too. The highest priced item in the book is the Flying Carpet/Tent @ 90,000 which is actually pretty dang cool, the +5 version of the Ring of the Meh coming in at 50,000, and otherwise the next highest priced gear is the oddly cool signpost at 10,000. Armor Vents are great, as is the little personal heater (burner). A small selection of spells (mostly reprints I think, but not sure). The centerfold map is kind of cool, but at the same time, I was kind of hoping for something similar to the People of the North, with tis for surviving and playing in that climate. Something this book sadly lacks pretty entirely, and was a large part of what I was hoping for from such a book. All in all, I liked it better than People of the North, but it shares many of the same flaws. Osirion, Qadira, and Thuvia, interesting. Could be a setup for the next (TBA) AP? EDIT: Given another announcement it is almost certainly so. Hmmm, nothing for Katapeshi characters? Or those from Rahadoum and other Garundi nations with a lot of sand in their back yard? I smell an Osirion AP, which would be hella fun! Especially with the Dominion of Black Elements in it. There's an error in the write up for this. The book will focus on northern Garund, so instead of Osirion, Thuvia, and Qadira, it's going to be Osirion, Thuvia, and Rahadoum. That makes more sense. Either way, I for one am excited. I'm really exctied to see Thuvia explored. The actual culture there is something that's been begging to be explored, especially considering how "blank slate" certain aspects feel compared to its neighbors. (how do they dress, what are the social structures like, what about the architecture?). And this is an excellent opportunity for Rahadoum to "win back the crowd" so to speak. It's had a hard time of things with the faces put forward for it in the past, but the page count here give them a more nuanced examination. Egyptian AP! :o finally an adventure to have my alchemist from Thuvia, Archeologist Bard from Osirian, Osirian Nobleman, and character inspired by Rick O'Connell from the Mummy movies. Probably make him a gunslinger. Would asking for a Pharaoh PrC might be a bit forward? I was wondering if the mention of Qadira might have been an error, especially since we already got a Qadira Player Companion (although we did get an Osirion one as well). That makes some of my speculations about what all of this portend a bit more focused. I'm guessing something that will take players throughout all of the various northern regions of Garund, then. I'll be especially interested in seeing what is done with Rahadoum, personally. I've been enamored by Rahadoum for a long time now. I even gave them the old French Revolution motto "Neither God Nor Masters" and have made the Pure Legion into a massive army of imperialistic, antitheist soldiers that now invade neighboring nations to liberate them from their religious masters. Ditto. Woo! I love controversy! PC-friendly stuff for Rahadoum and more stuff for Osirion? Woo! Now PC-friendly books on Numeria and Hermea, and my life is complete! Rahadoum, interesting, the land of anti-religion. I would love some stuff on Numeria and Hermea. Glad to hear that Rahadoum is included (even though I always think of Za'ha'dum when I read it). ... (even though I always think of Za'ha'dum when I read it). I always keep hearing someone warning "If you go to Rahadoum, you will die." Kinda true if you have the gumption to believe in a deity. Hmmm, it seems like there's a new Osiron focus. In addition to this, there;s also going to be a campaign setting book called Osiron: Legacy of Pharaohs. I wonder if they're prepping for an Osiron-centric AP or something. We should find out during PaizoCon. A RAHADOUM BOOK OH MY GOD. YES. On second thought, let us not go to Rahadoum. 'Tis a silly place. Will we see desert elves? Ouat dwarves? I'm really curious about non-human options in this book. Although it makes me impatient for the OTHER Osirionic countries to get their own treatment, i.e. Katapesh, Nex, Alkenstar, Geb. Maybe name them after a more Southerly constellation reknowned to the Osirionic peoples? Or a wind or sea current pattern? The Qadira Companion was made even before the final PRPG ruleset was finished, and it shows. Armored Kilts working very different from their subsequent appearance, and that Daivrat PrC just isn't up to snuff for a PRPG class/PrC. So I will not be surprised if/when Qadira eventually gets a new treatment, although it logically belongs in a group of other Kelesh Empire satrapies (perhaps focusing on the Western Obari satrapies? ), not Osirionic countries. And I don't know if it will fit in this product, but I feel like there has to be some interesting connections with other 'atheist' countries, such as that one holding in the River Kingdoms as well as the one in Tian, not to mention the "Petitioners" seem rather aligned with their ideology of not subjecting themselves to the Gods' whimsy. Hmm, could be fun, I liked People of the North. I think I'll wait until the product description is updated to make a final decision about preordering, but I certainly hope we'll get some sand magic to play around with. It would be cool if we got a desert/sand themed oracle mystery out of this too, though that might be copying the format of People of the North too much...we'll see! I would like to see some mystery or bloodline related to ancient osirian in this book. can't wait to get my hands on it. Ooh, Wizards specializing in architectural 'pyramid power' magic of stone and construction, effigies and sacred geometry, constructs and dungeons? Sandshaper Sorcerers, masters of dust and dune, alternately concealing and revealing and scouring away all traces of civilization as their whims drive them? Sphinx-touched Oracles of the Mystery of Riddles? Like a sort of "lesser Pharaohnic" divine bloodline? Something that traces Pharaonic lineage, or represents incarnations of past Pharaohs, or possibly parallel lines of divine mortals meant to fulfill important roles in Osirion alongside the main Pharaoh? Yes! Praise be Ra! This is exactly what I wanted. I hope you Paizo guys make more People of... books. Loved the People of the North. Well, you could arguably use the Imperial Bloodline from Advanced Race Guide to do a good job representing a pharoah bloodline...hmm, if your DM's all right with it, us an Aasimar with the scion of humanity alternate racial trait for the proper divine touch for such an Imperial Bloodline sorcerer? Mind, a new one would be awesome too. Set's ideas all sound great too. An alchemist archetype or some discoveries could be sweet, too, after all, an alchemist's already got mummification as a discovery and potentially a deep interest in immortality, so embracing that route and adding some more stuff that would be thematically appropriate...that would be a fun route to take even without a new archetype, come to think of it. Osirani alchemist who says he infuses an elixir with his Ka, seeking immortality, mummification, throw on a funerary mask perhaps...hmm, analogies between Nethys and Heka...speculation! Of course, that's steering away from Thuvia and Rahadoum, and I suppose Thuvia is a more likely source for alchemy...I just think the living mummy/immortality approach is more interesting than Inner Sea Magic's crypt breakers for Osiron alchemy. We shall see! I like Osirion and the focus on it. However, Katapesh, the Mwangi Expanse, Thuvia and the Shackle Isles hold a lot of promise when it comes to adventure. I hope the team will spend more time putting out products for these regions. Also, when will you be doing products for the Kelish portion of the world? I love what you have done with the Inner Sea region. I hope to see more products on Quadira, Thuvia, the Kelish Empire, the other continents and the region south of the Mwangi Expanse. Is there a time frame for releasing material on these and more information on Katapesh, Sargava and Jamleray? You guys know this book deals with Osirian And Thuvia along with Rahadoum, right? I will admit though the Kellish Empire could use more details. Yessir! I'm hoping that means the Osiria AP will end up taking PCs through one or both of those territories as well. I hope so too, but then again people of the north came out and we only went to Irrisen. Good point, although Jade Regent did go to the Lands of the Linnorm Kings as well as the Crown of the World. So perhaps there will be something to do with either Thuvia or Rahadoum, even if the Mask of the Mummy doesn't go there. Beware the fury of the sands! Oh my. Yes. This is on my to-by list. New Oracle Archetype, AND Sorcerer Bloodline? !